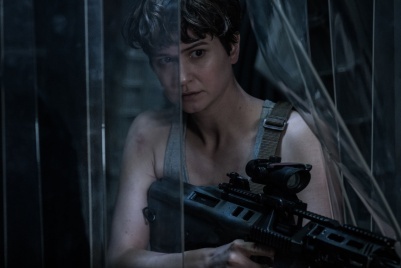 Katherine Waterston holds a modified Thales F90 as Daniels in Alien: Covenant. Katherine Waterston holds a 12 Gauge Double Barreled Shotgun as Emma Harrow in Boardwalk Empire. Katherine Waterston is an American actress who has appeared in such films as Michael Clayton, Inherent Vice, Fantastic Beasts and Where to Find Them and Alien: Covenant as well as the television series Boardwalk Empire. She also is the daughter of actor Sam Waterston.